Emma Heywood, a Lecturer and Researcher at the University of Sheffield’s Department of Journalism Studies, wrote this article which has been published on The Conversation based on her first-hand experience of life in the West Bank, where her research is focused on the role of local radio in NGO activities in war-affected zones. CFOM is re-publishing her article on our website because the issues raised by the subject-matter – the circumstances of the arrest and prosecution of a 17-year old Palestinian girl and her prospective trial in an Israeli military court – address issues of relevance to a wider debate about the protection of freedom of expression and other universal rights, as well as definitions of national security, and access to justice. Popular resistance against the Israeli presence in the West Bank, be it violent or peaceful, is a constant feature of life in the Occupied Palestinian Territories. With no money and little international support, Palestinian activists put their own lives at risk and sacrifice their well-being to fight the many aspects of control imposed by the Israeli state – checkpoints, permits, the wall, prisons – but mainly the lack of freedom, respect and dignity. This is what’s at issue in the case of Ahed Tamimi, the 17-year-old Palestinian girl who was arrested in December 2017 for slapping an Israeli soldier. A video of the incident, which went viral, was recorded by her mother, who was also arrested for uploading it. The slap came just an hour after the same soldiers shot Tamimi’s 14-year-old cousin Mohammed in the face, leaving him in a critical condition. Tamimi’s case has divided opinion, with each side accusing the other of exploiting it to support their own agenda. The trial has attracted criticism, partly because it concerns the arrest of a minor in acutely aggressive circumstances. Ahed’s appearance has also courted attention. Some in the Israeli press reported claims that the family are using Tamimi’s blonde, blue-eyed image for publicity purposes. Some have even questioned whether she could possibly be Palestinian “looking like that”. In the meantime, the judicial process is moving slowly. Her military trial was recently postponed yet again until March 11 – a decision that was taken behind closed doors after international journalists, human rights researchers and observers were ejected from the courtroom. Amid this chaos, I interviewed Tamimi’s father, Bassem. He claims the Israelis want to keep the case behind closed doors out of fear of international attention. While I was in the West Bank, I repeatedly encountered certain themes about the trial. All the Palestinians I spoke to deeply respect and admire the Tamimis, but many worry that Ahed’s high-profile case is detracting from other ongoing ones, of which there is no shortage. Tamimi is the tip of the iceberg. According to the prisoner human rights association Addemeer, there are more than 450 children in Israeli prisons, a figure which has doubled in the past three years. Tamimi’s age is not exceptional, and nor is her treatment. Western media must be careful not to focus on fragmented aspects of the occupation, be it the wall, the checkpoints, certain arrests, and be distracted from looking at the occupation as a whole. But as Bassem sees it, if Ahed is the one to bring the occupation to the fore, then so be it. But what about Tamimi’s safety, her welfare, her education? Is the extended family that lives in Nabi Saleh, the small village whose existence has been increasingly threatened since the creation of the expanding Halamish settlement, right to put its children (not just Tamimi) in such a position to further its popular resistance? What about the safer options that many Palestinians pursue in the richer bubble of Ramallah, the West Bank’s de facto administrative capital? Bassem agrees he torments himself that his daughter is losing her childhood, and is taking responsibility for something her generation should not be responsible for. But to him, normalising the conflict is not an option. He is more than aware that he and his family are taking on a heavy burden in representing occupied Palestine. He is in constant demand for interviews from journalists. Raising awareness of the cause, particularly internationally, is effectively his main occupation and not one he takes lightly. He speaks with pride of being a Fatah member and refuses to hear ill of those in charge. His apparent stoicism could be interpreted in the West as hard-hearted, uncaring and even manipulative, yet in Israel and Palestine, he cannot afford to be perceived as playing the victim. Any display of emotion – however well received by international audiences – would only weaken his cause. There is no question about the pride he has for Ahed. Swiping through some photos on his phone, he lands on one of her when she is about ten, wearing a pretty summer dress of traditional Palestinian cloth, smiling at the camera. He hesitates for a moment as he looks at it, and yes, emotion flickers across his face – then instantly, it’s back to business. The Tamimis’ campaign, which aims to raise awareness of all the ills caused by the occupation, extends to social media, weekly Friday demonstrations, and other protests. Bassem talks proudly of Janna Tamimi, his 11-year-old niece, who’s developed a profile as Palestine’s youngest journalist. More commonly known as Janna Jihad, she has more than 250,000 followers on Facebook, and uses Twitter, Instagram and YouTube to report on the occupation – as do other members of the extended Tamimi family. 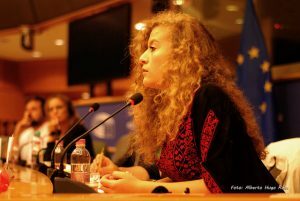 Regardless of whether Ahed is being noticed primarily because of her appearance, the moral point is whether or not her case can be used to the benefit of the many other minors who are or will be under arrest. The Tamimi family are not optimistic about the eventual outcome of the postponed trial, but even with a sentence of up to ten years on the cards, Ahed herself still plans to study law in order to fight for others in similar situations.